I've started to get back into guitar playing, and like most guitarists, there's a certain level of obsession with gear. I'm looking at some revisions to my old set-up. Some things are getting old, some things were never quite right, and some of it I'm just tired-of. This is my guitar set-up. 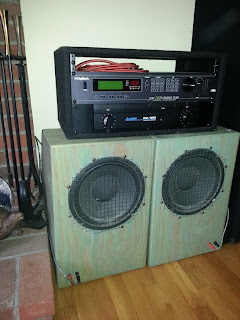 I built the speakers back in 1993 or so. They're made of 3/4 and 1/4 plywood laminated together for a total thickness of almost an inch. 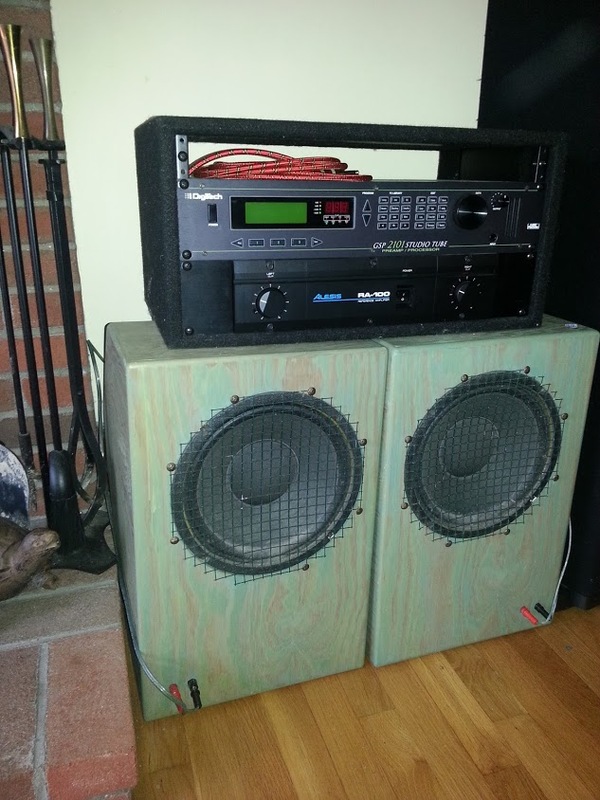 The drivers are Celestion 10", and the enclosures have no porting (infinite baffle). They sound great for both guitar and bass at low to medium volumes. The amp is an Alesis 50W/channel stereo, solid state. Clean, sounds OK. I've never run it beyond 3/4 volume. The pre-amp/effects is a GSP2101, again from around 1993. It's nearly 20 years old, but people still use them. I've upgraded the hardware and firmware to the "Artist" level - it's got 2 cpus (actually, Z80's that I had coded for in college). The front section is analog, with a tube preamp and analog EQ, which feeds the digital processing section. It came with lots of presets that I'm sick of, but it's super-programmable. I've also got the floor pedal controller (Control-One) that goes with it. It's still functional, but a bit glitchy. The footswitches are kind of weak - membrane switches with plastic buttons. 1) A better power amp, preferably a tube amp. I may have to give up stereo. 2) A better pre-amp, again, preferably a tube amp. 3) A simpler, more subtle effects processor, mostly just chorus, delay, reverb - not on the floor. 4) foot-switching that's solid, dependable - controlling both pre-amp (distortion, boost) and effects. 5) a looper - preferably part of the effects unit. Oh, and I'd like to avoid spending a zillion dollars on all this. This means that I'm likely to stick with the effects section of the 2101 - it has "effects loop" connections between the pre-amp and the digital section. I may also try replacing the tubes in the preamp. I play a Fender Stratocaster with Lace pickups - it's bright and clear, but difficult to get current metal sounds out of. I may also shop for another guitar to complement this - a darker, fixed-bridge guitar with more standard double-coil pickups.